Sorry... the 2017 Toyota Avalon is no longer being sold as new. Instead, take the first step to a great deal on 2019 Toyota Avalon with a free price quote! 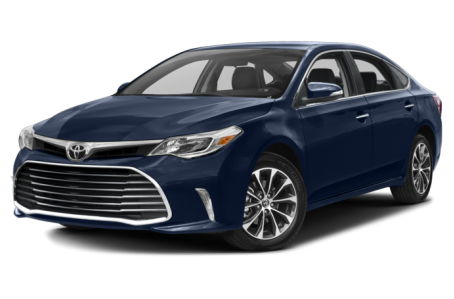 The 2017 Toyota Avalon is a full-size family sedan that competes with the Ford Taurus, Hyundai Azera, and Chevrolet Impala. This year, it remains largely unchanged, but Toyota Safety Sense P is now standard. The more fuel-efficient Avalon Hybrid version will be covered in a separate overview. Five trims are available: the XLE, XLE Plus, XLE Premium, Touring, and Limited. The Avalon has a bold front-end that includes angular-yet-narrow headlights with daytime running lamps, a narrow-slit front grille, and an exaggerated open-mouth fascia. The rest of the body has a more conventional appearance. The Touring trim, however, comes with slightly sportier styling. Standard features include power/heated side mirrors with turn signal indicators and a dual-pipe exhaust system. Available features include HID headlights, LED headlights, LED daytime running lamps, LED front fog lights, a rear spoiler, and larger 18-inch wheels. Under the hood, the Avalon is powered by a standard 268-hp, 3.5-liter V-6 engine mated to a 6-speed automatic transmission. Fuel economy for the Avalon is an EPA-estimated 21/31 mpg city/highway. Inside, the Avalon has a gray-stitched, leather-trim interior with front bucket seats and a 60/40 split-folding rear seat. The center stack includes a standard Entune audio system that includes a 7-inch touchscreen, CD/MP3 playback, Bluetooth connectivity for phone and audio, Siri Eyes Free mode with voice recognition, and a USB port. It can be upgraded with an integrated navigation system, a Qi wireless smartphone charging station, and a JBL premium audio system. Standard features include dual-zone automatic climate control, power front seats, remote keyless entry, and push-button start. Available features include rear HVAC, a memory seat, heated/ventilated front seats, heated rear seats, and a power moonroof. The Avalon earned a full 5-star overall crash test safety rating from the National Highway Traffic Safety Administration (NHTSA). A backup camera and a tire pressure monitoring system come standard as well as Toyota Safety Sense P, which includes a pre-collision system with pedestrian detection, lane departure warning, and adaptive cruise control. The available Safety Connect service includes emergency roadside assistance, stolen vehicle locator, and automatic collision notification. Other available features include a blindspot monitoring system and rear cross-traffic alert. The Touring trim comes with a unique, adaptive suspension system for a more engaging driving experience. 36 of 36 (100%) consumers said they would recommend this vehicle to a friend.